Carry Me Down leaves you with a lump in the throat after you’ve closed the cover. It’s such an authentic portrait of what it is to be a lonely adolescent who’s an awkward misfit, though thankfully not every lonely adolescent tries to smother his mother. The focus of this book is on the brutality of childhood, as well as the huge impact parents play in forming the psyches of their children. Though not an abused child per se, John Egan is raised by somewhat unstable parents who don’t always provide him with the emotional and financial stability he so desperately needs. He becomes a compulsive liar who’s convinced he has a preternatural ability to detect lies in others, and as such he’s somewhat an unreliable narrator. The reader can read between the lines and get a good general idea of the truth, by knowing the reactions of the other characters, so the occasional delusions of John are easily seen through. He is a liar, but not a sophisticated one. There’s a lot of innocence in him, through it all, and this is what gets our sympathy. He’s a child who needs a lot of love and who gets precious little, and that’s what breaks the reader’s heart more than anything. After finishing this book last evening I cannot get it out of my head. It’s dark and sometimes depressing, but in the end redemptive. No wonder the Booker committee chose it. It illustrates a very good instinct for picking out another up-and-comer to watch. 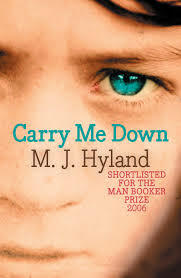 I expect Hyland may not have the visibility to actually win the prize, but this is one of the most heart-rending books I’ve read in a while, and it definitely deserves making the Longlist. It’s so worth making the effort to fit this one into your reading schedule. In other Booker news, at the half – 3/4 point in Grenville’s The Secret River. It’s still fabulous, staggeringly so, and I know I’ll be torn when making my official final prediction for the prize after I’ve finished this one. They’re all just so dratted good!